So, what’s the connection between Clayoquot Sound and oysters? Why a celebration of oysters and the sea in Tofino? Why is November Oyster Month in Tofino? Picture oysters hanging on long lines in deep, cool, pristine waters, and you are picturing Clayoqout Deep Water Oysters. Oyster cultivation in Clayoquot Sound began in the 1950’s. In 2004, there are now about 12 shellfish tenures in Clayoquot Sound, with the majority of the farms located up Lemmens Inlet. The current production of Clayoquot oyster farms is an estimated 50,000 gallons annually. The oyster of choice is Crassiostrea Gigas, or the Pacific Oyster, which was first introduced to the west coast in the early 1900’s. As filter feeders, oysters extract food from their environment by pumping water past gills which trap plankton. With this close interconnection, the quality of an oysters growing environment is very important, ensured by strict government health regulations and continuous water quality testing. There are several techniques for growing oysters, but currently the long line method is most prevalent in Clayoquot Sound. Growing on long lines allows the oysters to hang in the deep waters and feed continuously, taking about two years to grow to market size. With this method they invest less energy in shell thickness, and have smaller abductor muscles than beach oysters, with more plump meat for a given shell size. By hanging in the cool depths they are also free from heat influenced bacteria that cause some beaches to be closed in the summer months, and are usually available for year round harvesting. Oysters vary according to the locality, like wines, and most type names are really place names. 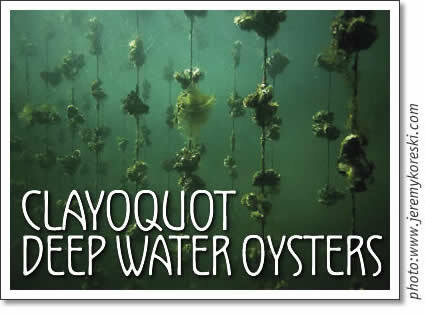 Clayoquot Deep water oysters tend to be clean, mild and sweet free of silt or taste of the substrate. Since Roman times it has often been believed that oysters are an aphrodisiac. Aphrodisiac or not, the diversity in which oysters can be prepared along with their nutritional composition makes them a natural fit for special occasions and everyday feasts. Oysters are said to be a good source of protein, beneficial Omega-3, and an excellent source of vitamins and minerals, including iron, copper and zinc. For more information about the Clayoquot Oyster Festival visit our Tofino oyster fest page. For more information about Clayoquot Deep Water Oysters contact Pat Koreski at pkoreski@alberni.net or Michael Mullin at 250.725.4222. Both Pat and Michael are oysters growers and members of the Clayoquot Sound Shellfish Growers Association.